Shwesandaw Pagoda was built by King Anawrahta in 1057 and it happens to be the highly visited temple in Bagan. The Buddhist temple which once had terra cotta tiles displaying the scenes from Jataka, today is a marvel with five terraces, a cylindrical stupa, a bejewelled umbrella. This is one of those few places which have hairs of Gautama Buddha treasured within the Pagoda. The view of sunrise from here is as mesmerising as the sunset. Also, this is one of the few temples in Bagan which one can climb, unlike others, which can be visited at ground level only. How popular is Shwezigon Paya? 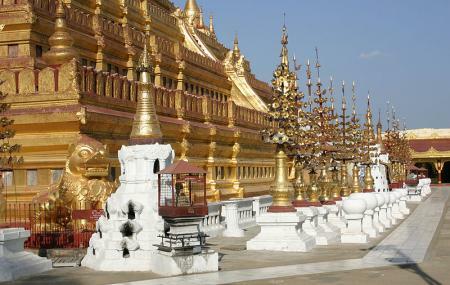 People normally club together Mount Popa and Dahmmayan Gyi Phaya while planning their visit to Shwezigon Paya.